Rise and shine fellas! I'm stoked to release a series of floral recipes alongside Windflower Florist over the span of three months. Be sure to look out for more alluring, floral recipes! Convenience is key to prepare breakfast when we live by racing against time once we get off from bed. Therefore, for the first item of this floral repertoire, I'm serving a light, zingy and filling Elderflower & Cherries Smoothie, perfect for a quick breakfast. 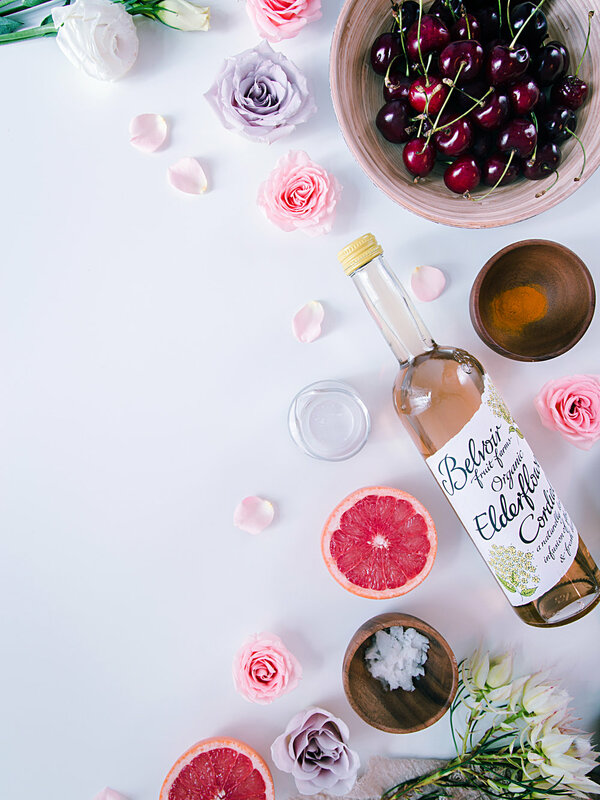 Does elderflower remind you of the Prince Harry and Meghan Markle's stunning wedding cake? Fixing this smoothie comprising of cherries, frozen bananas, grapefruit, coconut oil and turmeric, you'll be certain that this combination is packed with power antioxidants, and good fats to last you through a long morning. Even if you only have 5 minutes every morning to fix a breakfast, you can pit the cherries and slice the grapefruit the night before. Then, put all sliced cherries and grapefruit in a bowl, and cover them with a cling wrap or a plate to prevent them from drying up. Alternatively, you can blend the smoothie and store it an airtight mason jar or container overnight to stop it from oxidising. However, do not be alarmed when that rosy pink mixture has browned overnight, it is still nutritious and drinkable. The browning effect is a result of cherries, or any berries added in the smoothies. Shake it up before you drink in the morning. Before we start making this smoothie, let's talk about cherries! Cherry is the fruit of this summer harvest. The sweetness of cherries are addictive, and amazingly nutritious to snack. Step into any nearby supermarket, look out for the shelves at the front of the store, you'll never missed containers of cherries on promotion. Select cherries that are dark red, firm and glossy on their surface. Dark coloured cherries indicate their ripeness and sweetness. Handpicking them will be ideal instead of buying them in a plastic container. If you're thinking of storing them for more than a week, choose those with a lighter red tone. To maintain its best sweetness and condition, refrigerate them in a plastic cover crate, or plastic bag for a week. With a low glycemic index of 22, lower than blueberries (54) or strawberries (41). Therefore with a lower GI level, it will not have much impact to increase our blood sugar levels, which make them better for healthy snacking. Slows the aging process, reduces post-exercise muscle pain. Cherries ranked as the highest antioxidant level amongst any fruit. Antioxidants help the body fight the free radicals that make us look old and form a protective layer to reduce muscle damage and pain after strenuous exercises. Vitamin A,B,C and E are present in cherries. The abundance of vitamins improve blood circulation that results in regenerating of existing hair cells and boosting hair growth, strengthening of hair follicles, and maintains moisture in the hair and scalp. If you have any questions regarding this recipe, leave a comment below!Hope you enjoy this perk me up smoothie as much as I do! Also, to end sign off, here's my summer playlist of soothing beats to get ready every morning! Peel bananas skin, cut them in quarters and freeze them at least one night before using. Give the cherries a good wash to remove any remaining pesticides. Pluck the stem, take a knife to cut around, give it a twist, and remove the pit. Slice around the grapefruit to remove skin. Remove the pith (white bitter part) of the grapefruit, and cut the remaining into bite sized chunks. Place all ingredients into a blender, and blend for 2 to 3 minutes or until smooth. For a thinner consistency, add 2 tbsp almond milk each time and blend again till desired.